I woke up several times last night because of the heat and humidity. We have a fan blowing in our room that helps cool us down but it is still too warm for me to sleep comfortably. I also had several mosquito bites on my legs that were itching badly. I think they got me after my shower while I was writing in my journal. Even so, I arose well rested and ready to go. I took my weekly Mefloquin pill for malaria prevention this morning. I really didn’t notice any ill effects today from it. Last week I felt some brain fog after I took it. Some people have bad dreams and even hallucinations when they take it, but I seem to do well with it. Everyone else is taking the daily doxicycline pills, which only have sun sensitivity as a side effect. I prefer the once-a-week pill without the sun sensitivity. Here on the equator the sun really beats down on you hard. 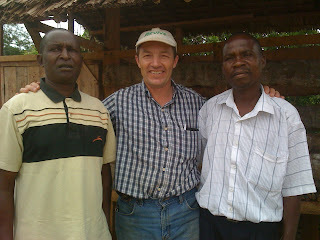 I worked with Patrick and Edison today who are on the Institute for Self Reliance and Agriculture (SRA) staff. They are working with the Koins for Kenya group to set up model garden and animal projects to show the people how they can grow all of the food that they need to eat in a small area of their land. The design has four garden plots that are planted one after another every two weeks. In this way, at least one of the gardens should be producing the entire year. The animal pens are built such that the animals are up off the ground and the waste falls underneath and is then gathered as fertilizer for the garden. We drove about an hour away to look at dairy goats that could be brought here and used in the program. They are Gala goats which appear to fit what we need nicely. We will be able to get about one liter of milk per day from each goat. We want to provide five or six goats to the schools so that they can pour the milk into the porridge that they feed to the children in the middle of the day. They will need to build the facility, then pay SRA back for the goats with the first offspring that the goats have. The children are so nutrient-deficient that even the tablespoon or two of milk that they will get each day will make a big difference in their diet and will enhance their ability to learn. We hope that as the children and adults see the goats at the school and learn how to care for them that they will want to have their own goats. We will have a small herd at Koins that we will use to train them how to properly care for a milking goat before we sell them a goat. All of our plans are focused on doing something that a villager can replicate. We use local materials to build our facilities and local resources for supplies and medicines. Our design is different than what I would do in the United States because the villagers could not afford to manage the goats like it is done in developed countries. Patrick, Edison and I make a good team because we bring all of our ideas together, then talk about what will work in the village. The design that we ended up with today is much different than what I had imagined before we started. This afternoon we discussed building small fish ponds with a chicken coop over one end so that the chicken feces would drop into the water, producing algae and food for the fish. The water could also be used to water their gardens, becoming a source of fertilizer as well. Bret took us to the other side of the river to see the terrible erosion that is taking place. The rains come so hard and the land is so barren that the water has carved out deep gorges. One that I was in was about 20 feet deep. We were trying to determine a way that we could stop the erosion or at least slow it down. Part of the problem is that any plants that grow are quickly consumed by the goats, leaving only a few thorny plants scattered around. The over grazing leaves the land without roots holding it together so the heavy rains wash it away. This evening we gathered around for our “peaches and pits” discussion. Each person has an opportunity to talk about the peach: one good thing they saw that day, or the pit: a bad or discouraging thing they saw that day. You would think that in this environment we would only be seeing the pits, but all of the group talked about peaches that they had seen today which included: a baby being born to a young mother who walked home several miles with her baby, a woman teaching the villagers how to make smokeless stoves so the people don’t have so many lung problems, a poor farmer who was able, with training, to raise enough money to send two of his children to school. He was also able to purchase a solar panel to put above his store so that he can recharge cell phones for people. Lastly, a group of laborers that dug the channel walls out so that a dam could be constructed. Bret pointed out that the little labors we are doing are answering the prayers of the mothers by saving their children’s lives. Something to think about. We thanked the Lord for our being born in the United States where our challenges were not so life threatening.